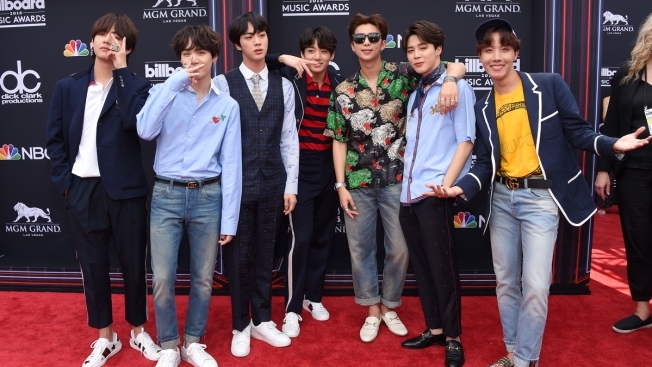 Boy Band BTS attends the 2018 Billboard Music Awards 2018 at the MGM Grand Resort International on May 20, 2018 in Las Vegas, Nevada. The Los Angeles Police Department is "looking into" a death threat against a member of a South Korean boy band that is scheduled to perform in September at Staples Center, an officer confirmed Thursday. "We are aware of the matter and are looking into it," said Officer Tony Im of the LAPD's Media Relations Section. Without offering any details, Im confirmed that a member of BTS, also known Bangtan Boys, has received a death threat. The seven-member group's tour dubbed "Love Yourself" includes a Sept. 5-8 stop at Staples Center.